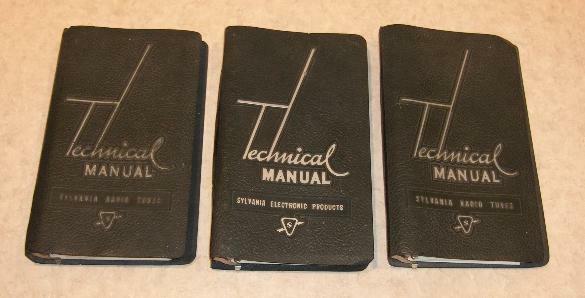 Following are two full Sylvania tube manuals. Unfortunately Sylvania didn't put data sheets on separate pages - they run together - so it's hard to break up the data into individual files and index them, like the HB-3 data set is. So I just broke the manual up into several parts. You'll have to look to see if the data you want is in there. The Sylvania manuals do have some data and curves that I haven't seen elsewhere, particularly for the loctal tube types. The Sylvania manuals are in Adobe Acrobat (PDF) format. I recommend that if you don't already have it you download the latest version of Adobe reader. Some files have compressed images that may not work correctly with older versions of Acrobat reader. The 1951 manual I have looks to be 100% original, no updated or removed pages. This manual is the better one for loctal data - some types were moved to "obsolete" status and into the condensed data section by 1959. The 1959 manual has had a lot of update pages inserted into it. This means that the data can be somewhat out of order. So if you don't find what you're looking for where it is supposed to be, look forward or backward a little bit just to make sure the update didn't get the data you're looking for out of order. If the type you're looking for is near the end or beginning of a section look in the adjacent section as well. The 1959 book lost some older tube data, and some of the good info in the appendix, but gained a bunch of picture tube (CRT) data, "modern" TV tubes, as well as some other odd info like crystal diode data. At over 750 pages this one has to stay broken into pieces!